Tips For Aerobic Exercise Fitness! Feel the air in your lungs and burn those unwanted calories! After all that is what aerobic exercise fitness is, using oxygen in your workout. Loads of activities can be classed as aerobic, but I'm going to focus on walking and running (jogging). These are great for losing weight and many health benefits related to your heart. As always, the general rule is if you're unsure about your health, see your GP before starting any exercise. Remember your warm up and cool down before and after your workout. And before you start you'll need a great pair of exercise shoes and the right clothing. This is even more important for these aerobic exercise fitness programs, as they are quite high impact activities. Walking is great because it's so easy and natural. To get the most out of your walking, it's best to aim to do 30 to 60 minutes per day, 5 to 6 days per week - that's our end goal. Stand tall without leaning forward or back. Focus on a point about 10 metres in front of you. Relax your shoulders and tuck your stomach in. Each step should start with your heel, flow through your foot and spring off with your toes. Keep your steps smaller rather than larger. Larger steps won't increase your speed and will lead to injury. Bend your elbows slightly with each stride and keep them close to your body. Keep hydrated by sipping lots of water before, during and after your workout. It's best to start off slow and build gradually from there. Always gradually increase your workout by adding 5 to 10 minutes each week. You may feel like you can do more, but gradual progression is the key to safe exercise. There are no quick fixes in aerobic exercise fitness. Here is an example walking fitness program. You can copy and paste it to your desktop or print it directly from here. Carry on each week with this trend of adding 5 minutes, until you achieve your end goal. The speed of your walking totally depends on you. The same principle applies to start slow and gradually build from there. You should never be walking so fast that you're out of breath. Maintain a pace where you could have a conversation at the same time as walking. I end up talking to myself! The best way to record your walking is to use a calendar. For each day that you walk record the time, distance and 'difficulty'. If you're not familiar with distances in your area then use any online map service to find out how far you walked. 'Difficulty' is basically how the walk felt, if it was easy or hard, whether you felt any pain etc. If you feel your previous walking week was very hard, then don't add anymore minutes until you feel comfortable with it. By now all this must be a walk in the park! Ok enough of the terrible puns, let's move up a gear with aerobic exercise fitness, to running fitness. Decide on your end goal before you start. This will depend on why you decided to start running in the first place. Remember it's your personal goal, not anybody else's. So make it something you can achieve. Examples are to lose a certain amount of weight, or to train to run in an event. Set your time frame too (i.e. event is in 12 months time). Always start slow, literally walk before you run. If you haven't run before or for a few years, then do the walking fitness program first and then ease yourself into running. Your knees will thank you for it later. Be your own coach and record your running. Use a calendar and record the time, distance and difficulty of each run. 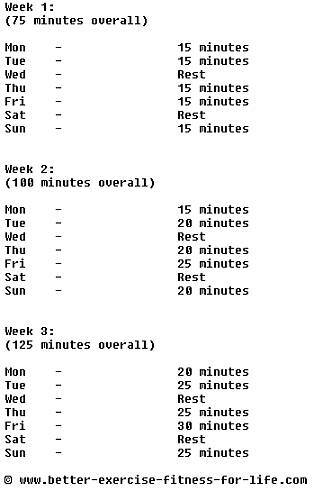 Use this information to track your progress and gradually improve. If you are running to lose weight, then review and adjust your diet the fun way. It's a balance of calories, so you should be burning more calories whilst running than you are eating. Click here to see how you can do this and enjoy the food you love. You can see the trend of adding 2 or 3 miles each week. You may tweak this depending on how your body reacts to each run. If the progression of the workout is too hard then repeat the previous week's distances. This is safe and sensible running. Start the first couple of weeks at slow jogging speed. Build up from there. Make sure you can always breathe enough to be able to have a conversation. That is your guideline, if you can't then you're going too fast. Think about the gradient of your run if you're outdoors. The running fitness program is based on flat ground. A general guide would be that up hill counts as double distance. Always listen to what your body is telling you. If you're running on a treadmill then you won't have this problem. It is good to experiment with different gradients once you've been running for at least 4 weeks. Rest days are rest from running. You could use this time to do some strength training or swimming aerobics or you could just rest those legs completely! It all depends on your end goal. As these are all high impact activities, they take their strain on your legs. The most common injuries are of your knee. But you could feel pain in your feet, ankles, shins or hips. It's best to combine some strength training of these parts of your body with your aerobic exercise fitness. The most important thing is to warm up and cool down with each workout, and focus your stretching on your legs and back. Footwear is also a vital factor. The wrong shoes will affect your whole body. Click here for advice on footwear. If you are recovering from a lower body injury, then I recommend you stay away from running until you are fully fit again. That means strengthening those muscles. Click here for sports injury physiotherapy advice. Don't forget to enjoy your aerobic exercise fitness! Your motivation to carry on will increase if you make it enjoyable. That way you will achieve your end goal! Listening to your favourite music tracks is a great way to keep going with your aerobic exercise fitness. Return to Health Fitness Exercise from Aerobic Exercise Fitness. Return to Home from Aerobic Exercise Fitness.